How do I enable company directory support on menus in Architect? 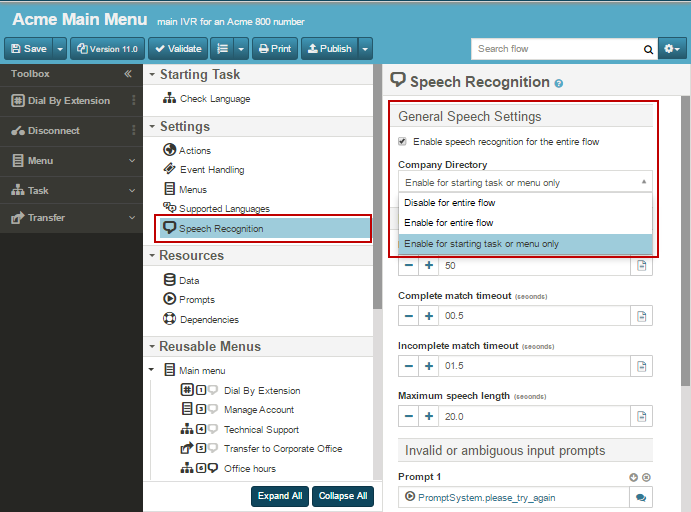 By default, company directory speech recognition is enabled for new flows. When enabled, callers are not be prompted to say the name of the person they want to reach. Architect does not provide automatic prompts for use when this feature is enabled--you must include instructions for the user in your recorded prompts. Open the flow for which you want to enable company directory support. In the flow’s Settings area, select Speech Recognition. In the Speech Recognition design area, under General Speech Settings, ensure the Enable speech recognition for the entire flow is checked. Upload or record your company directory prompts. For more information, see the Suggested content.